Director of media relations Gwen O’Brien said Tuesday will be the best opportunity thus far for dialogue between administration and students. She said Mooney is committed to the topic of sexual assault and wants seniors to have a chance to discuss their concerns before graduating. O’Brien said the conversation will involve only students, with the exception of Connie Adams, director of the Belles Against Violence Office. She said the discussion is necessary in order to make progress. “[Tuesday] is a time for students to have the opportunity to speak candidly with Carol without the media present, because it really is about the students,” she said. O’Brien said she hopes students will be honest with President Mooney because that is the best way for the conversation to be productive. 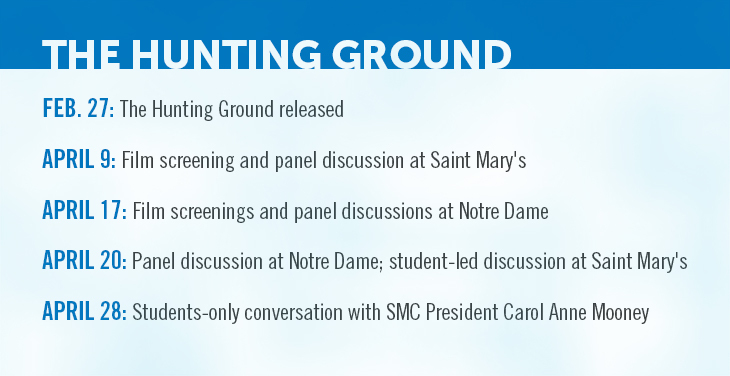 Over the past several weeks, “The Hunting Ground” has sparked discussion and debate on both Saint Mary’s and Notre Dame’s campuses. The College screened the documentary April 9, which features Notre Dame as a school that ineffectively responds to sexual assault allegations, some against Saint Mary’s students. Mooney introduced the film, and from the audience during the panel, she addressed concerns that she had disregarded a student’s sexual assault complaint. A second panel discussion, run by students, April 20 covered a range of issues and proposed a list of recommendations for the Saint Mary’s administration on providing more support to victims of sexual assault. Alumnae, as well as students, have expressed concerns about the issue raised in the film. Through Care.org, 2013 graduate Jessica Lopez created an online petition. Lopez said the petition, which resembles the petition that arose from the April 20 panel discussion, has 301 signees, with a goal of 500. Lopez said there are several reasons alumnae are signing the petition. “First, we love our school, we support its mission, and we want to hold it accountable for its actions,” she said. “Second, we support our students and advocate for their safety. Three, we have been impacted by sexual assault either personally or through a friend, and we don’t want the past to repeat itself. Lopez said she saw “The Hunting Ground” on April 9 when it showed in Bloomington, Indiana. During her time at Saint Mary’s, Lopez was a history and humanistic studies double major with a minor in Gender and Women’s Studies (GWS), and she heard about the documentary on the GWS Facebook group. Lopez said she decided to draft the petition for alumnae because of her love for the College. The main platform for advertising the petition is social media, Lopez said. The response to the petition has been exciting and speaks to the Saint Mary’s experience, Lopez said. Lopez said current students have been the guiding force behind drafting the alumnae petition. A senior at Saint Mary's, Haleigh is majoring in Communication Studies and English Literature & Writing. She serves as the Saint Mary's editor and enjoys coffee, guacamole and good books.